A select set of Twitter users are being freed from their 140-character shackles, at least temporarily, as the ubiquitous social network tests methods by which users can better express themselves while maintaining the brevity that popularized the platform. Explained in a blog post on Tuesday, Twitter is doubling the upper tweet limit to 240 characters in a bid to better tailor the service for users who feel constrained by existing constraints. 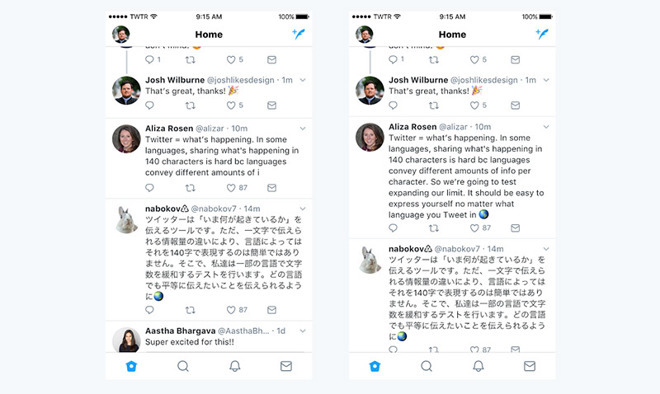 Penned by Twitter product manager Aliza Rosen and senior software engineer Ikuhiro Ihara, the suggests nuances in the world's written languages played a significant role in Twitter's decision to launch the pilot program. Depending on their native tongue, some users are able to express their thoughts in much less than 140 characters, while others might find the limit too restrictive. In essence, the change levels the playing field when it comes to logographic languages like Chinese, Korean and, with Kanji, Japanese. Those languages can relay a sentiment with a single character, something that might take multiple words in English or other languages that rely on Roman characters. Twitter calls this phenomenon "cramming." "We want every person around the world to easily express themselves on Twitter, so we're doing something new: we're going to try out a longer limit, 280 characters, in languages impacted by cramming (which is all except Japanese, Chinese, and Korean)," Twitter says. As proof, the company offered up a few tidbits of data, saying that only 0.4 percent of tweets sent in Japanese reach the current 140-character limit. On the other hand, some 9 percent of tweets posted in English hit the maximum. On average, most Japanese tweets are 15 characters in length compared to 34 for English. Further, research shows people who are not impacted by cramming tend to use Twitter more often. Though it is testing longer tweets, Twitter stands by its commitment to brevity. The evaluation period is meant to gauge consumer interest and what impact, if any, access to longer tweets have on the service's popularity. Twitter's new 240-character limit is rolling out now to random users in all languages except for Chinese, Japanese and Korean. The company did not specify how long the trial period will last, nor did it reveal an estimated sample set size.